Recycling is dead. Long live recycling. How do you illustrate a commodity collapse? If you’re my colleagues at Bloomberg, you take 33 different materials – metals to crops – and you create an index. Lately, it’s a downward plot. But as much as I like graphs, I’ve been searching for another way. One copper trading friend told me that business is so slow she’s going to yoga more. So – perhaps a pic of a broker doing yoga could represent the bust? Or perhaps I should just go take a picture of an idled Australian iron ore mine. Anyway, this all came to mind last weekend while I was in Ningbo, China attending something called the Secondary Metals Forum. It’s an annual convention for traders, processors, and regulators of China’s massive non-ferrous metals markets. Since 2003, I’ve been to all but two editions of the event, seeing it in good times, and bad (see chapter 13 of my Junkyard Planet for an account of the very ugly one in 2008). 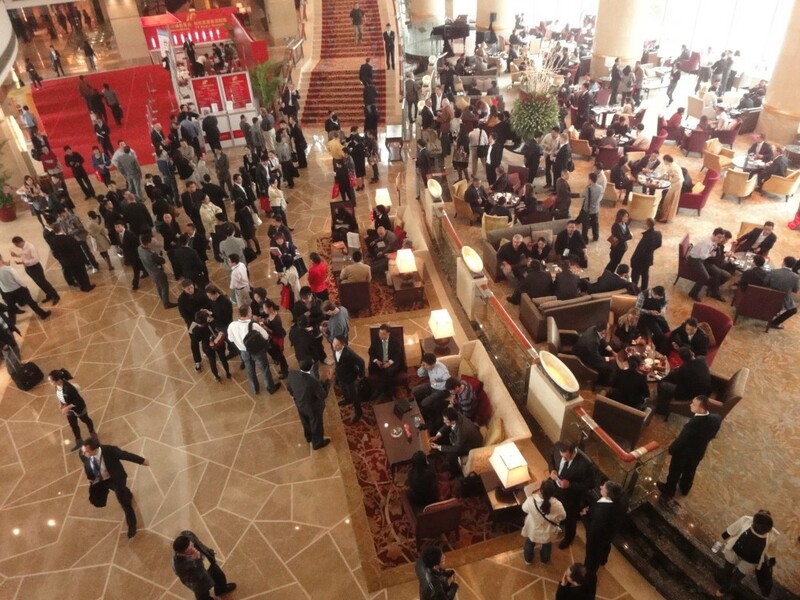 Anyway, here’s a pic of the hotel lobby at the 2010 convention in Ningbo. All those little conversation groups? Those are suppliers and importers negotiating prices on a trade that ran up more than $20 billion in sales between the US and China alone that year. It was a raucous place, the nexus of a global market (the global benchmark for some very important commodities are being set before your eyes), and the hotel staff weren’t pleased. How did that same hotel lobby look like last weekend? Unfortunately, I didn’t think to take a photo (idiot). So I’ll tell you: Take away 80% of the people clustered in the lobby area (to the left), and leave most of the group drinking in the bar. But in fact it was more interesting than that. Last weekend American scrap dealers once wined and dined at CMRA for their scrap became sorry convention wallflowers, wishing desperately for someone to accost them for their metal. But China’s infrastructure and housing boom is over, and it really doesn’t need much scrap metal at the moment. So American, and European, and Australian, and Japanese scrap dealers spent the weekend asking around for somebody to buy their scrap. I walked through that hotel lobby, and nobody gave me a second look. Global commodities boom, RIP. I bring this up for two reasons. First, it serves as an interesting End Note to Junkyard Planet, which chronicled the upswing in China’s – and the global scrap trade’s – two decades of Chinese-fueled good fortune. But I also bring it up because lately there’s been a great deal of discussion as to whether recycling is “worth it.” In October John Tierney, a New York Times columnist, started it with in an influential piece arguing that there’s no economic rationale for recycling. He argued that we do it for much squishier reasons, like morality. Now, I’m all about the economics of recycling. And that’s why I was so puzzled by Tierney’s easy dismissal of a multi-billion dollar global industry that accounts for over half of the world’s global raw material supply, and employs millions. Tierney, predictably, never addressed the global markets in recycling. Instead, he cited the ludicrously high cost of recycling in New York – a municipality renowned for its inefficiencies – as his sole data point showing that recycling is a money loser. This is a bit like arguing that breathing air is bad for you and using data from Beijing as your sole example. True as far as it goes, but no further. In fact, this was not Tierney’s first whack at the recycling industry. In 1996, he wrote an even longer essay (“Recycling is Garbage“) that also tried to argue against the economic rationale for the 200-year-old recycling trade. The timing was interesting. Right around the time Tierney published that 1996 essay, the global commodities boom was rumbling to a start, and the global recycling industry began a two decade boom that paralleled it, generating some of its biggest and most sustained profits since WWII (seriously – who writes an article arguing there’s no merit to an industry that just ran record profits for two decades?). During those years, you had to try really, really hard to lose money in the recycling business. Wisely, Tierney didn’t write a recycling essay during the boom. If he had, he would’ve had to explain that his 1996 essay got the economics of recycling 100% wrong. Instead, he waited until October of this year, when the commodities and recycling markets were at their bottom, and renewed his argument that there’s no economic rationale for recycling. Not to keep hitting the analogies – but that’s like arguing that there’s never been an economic rationale for the oil industry, and resting your argument on this year’s depressed oil market. So here’s the thing .Commodity demand comes and goes. Currently it goes. Will aluminum, paper, and plastics ever reach their boom time highs? No idea. But I’d be willing to bet that they’ll be worth more in three years than they are today. In the meantime, I know of recyclers on both sides of the Pacific who are investing heavily in technology (and doing yoga) during the commodities downturn. They aren’t doing it because they think commodity prices will forever languish, or because they believe – as John Tierney does – that recycling is “on the wrong side of … long-term global economic trends.” They’re doing it because the recycling business has been a key component of global manufacturing since the Industrial Revolution (currently 60% of the US steel supply comes from scrap metal). Critics and cranks can argue that it makes no sense. And my friends in the industry can complain that low prices are taking a toll. But there is, and always will be, a recycling trade. Nothing – newspaper columnists or bad markets – will change that fact. One final note, courtesy of my grandmother. She spent her life in the junk business (as she liked to call the global scrap non-ferrous metal trade) and she used to remind me. “I like people who think junk isn’t worth anything,” she said. “That leaves more for us.” Take that for what it is: wisdom about who you should be betting on. This entry was posted in Scrap by Adam. Bookmark the permalink.